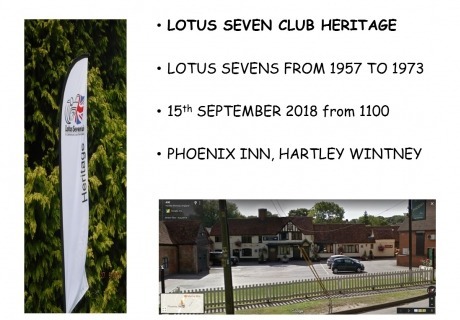 The Heritage Section of the Lotus Seven Club is holding its first event for Lotus Sevens at the Phoenix Inn, Hartley Wintney on the A30 near Fleet on Saturday 15th September. This is a pub with several famous connections with Lotus and our Club and is a great place for our first meeting. From 11 o’clock, I hope we will be seeing a wide range of Lotus Sevens in reserved displays in front of the pub and at the rear with the ESV. The pub will be reserving restaurant places for us, and there are all the usual facilities. I hope you’ll tell all your friends with Lotus Sevens in the Club and I hope we’ll see a good turn out of members who don’t own Lotus but are enthusiastic about our roots. It should be a great day out. You can talk to me, Rod Thonger on 07836 271429 or email [email protected] to find out more. There will be more updates as we go along.